The Assyrian/Chaldean/Syriac people (frequently known as Assyrians in English, besides Syrians, Syriacs, Syrian Christians, Syriac Christians, Suroye/Suryoye and other variants, see names of Syriac Christians) are an ethnic group whose origins lie in the Fertile Crescent, their homeland today being divided between Northern Iraq , Syria , Western Iran , and Turkey 's Southeastern Anatolia. Many have migrated to the Caucasus, North America and Europe during the past century. The major sub-ethnic division is between an Eastern group ("Syrian Nestorians" and "Chaldean Christians") and a Western one ("Syrian Jacobites"). There are diaspora and refugee communities in Europe, the former Soviet Union, North America, Australia, New Zealand, Syria , Jordan , and Lebanon . Emigration was triggered by such events as the Assyrian genocide in the wake of the First World War and the breakup of the Ottoman Empire, the Simele massacre in Iraq (1933) and the Islamic revolution in Iran (1979). The latest event to affect the Assyrian community is the war in Iraq; of the one million or more Iraqis reported by the United Nations to have fled, nearly forty percent (40%) are Assyrian, although Assyrians comprise only three percent of the Iraqi population. The Syrian Malabar Nasrani, also known as the Saint Thomas Christians of Malabar, are another Syriac Christian group, but are ethnically distinct from the Assyrian people of the Middle East. The Assyrian people trace their origins to the population of the pre-Islamic Mesopotamia, since the time of the Akkadian Empire . It was not until the Neo-Assyrian Empire that the Assyrians began to speak Aramaic, the language of the Aramaean tribes who had been assimilated into the Assyrian empire in the 8th century BC. due in part to the mass relocations enforced by Assyrian kings of the Neo-Assyrian period. They were Christianized in the 1st to 3rd centuries, in Roman Syria and Persian Assyria.They were divided by the Nestorian Schism in the 5th century, and from the 8th century, they became a religious minority following the Islamic conquest of Mesopotamia. Culturally and linguistically distinct from, although quite influenced by, their neighbours in the Middle East - the Arabs, Persians, Kurds, Turks, and Armenians - the Assyrians have endured much hardship throughout their recent history as a result of religious and ethnic persecution. The most significant recent persecution against the Assyrian population was the Assyrian genocide, which occurred at the onset of the First World War. This led to a large-scale resettlement of the Assyrian people in countries such as Syria, Iran and Iraq, as well as other neighbouring countries in and around the Middle East. Since the Iraq War starting in 2003, there has been a massive persecution of Assyrians in Iraq, mostly by Islamic extremists. In places like Dora, an estimated 90% of Iraq's Assyrian population has either fled or been murdered. Incidents such as the Jyllands-Posten Muhammad cartoons and the Pope Benedict XVI Islam controversy have hit the Assyrian communities directly. Since the start of the Iraq war, at least 46 churches and monasteries have been bombed. The Assyrians are considered to be one of the indigenous people in the Middle East. Their homeland was thought to be located in the area around the Tigris and Euphrates. There is a significant Assyrian population in Syria where an estimated 877,000 Assyrians live.In Tur Abdin , known as the homeland for Syriacs, there are only 3,000 left, and an estimated 15,000 in all of Turkey. After the 1915 Assyrian genocide many Assyrians/Syriacs also fled into Lebanon, Jordan, Iran, Iraq and into the Western world. the "Chaldean Christian" or "Chaldean Catholic" group of northern and central Iraq, northern Iran, and eastern Anatolia (Chaldean Catholic Church); Chaldeans make up the majority of Iraqi Christian population. Ever since the Assyrian Genocide many Assyrians have fled their homelands for a more safe and comfortable life in the west. Since the beginning of the 20th century the Assyrian population in the Middle East has decreased dramatically. As of today there are more Assyrians in the Western World then there are in their homeland. A total of 550,000 Assyrians are currently living in Europe. Large Assyrian/Syriac diaspora communities can be found in Germany, Sweden, the USA , and Australia. The largest Assyrian/syriac diaspora communities are those of Södertälje , Chicago , and Detroit . Assyrians are divided among several churches (see below). They speak, and many can read and write, dialects of Neo-Aramaic. In certain areas of the Assyrian homeland, identity within a community depends on a person's village of origin (see List of Assyrian villages) or Christian denomination, for instance Chaldean Catholic. Today, Assyrians and other minority ethnic groups in the Middle East, feel pressure to identify as "Arabs", and "Kurds". Assyrians in Syria are disappearing as an ethnic group, due to assimilation. Neo-Aramaic exhibits remarkably conservative features compared with Imperial Aramaic, and the earliest European visitors to northern Mesopotamia in modern times encountered a people called "Assyrians" and men with ancient Assyrian names such as Sargon and Sennacherib. The Assyrians manifested a remarkable degree of linguistic, religious, and cultural continuity from the time of the ancient Greeks, Persians, and Parthians through periods of medieval Byzantine, Arab, Persian, and Ottoman rule. Assyrian nationalism emphatically connects Modern Assyrians to the population of the Neo-Assyrian Empire.A historical basis of this sentiment has been disputed by a few early historians, but receives support from modern Assyriologists like H.W.F. Saggs, Robert D. Biggs and Simo Parpola, and Iranologists like Richard Nelson Frye. "Assyrians", after the ancient Assyria, advocated by some followers of the Assyrian Church of the East & the Ancient Church of the East ("Eastern Assyrians"), and some communities of the Syriac Orthodox and Syriac Catholic ("Western Assyrians") and Chaldean Catholics ("Eastern Catholic Assyrians"). "Syriacs" (Suryoye), or "Aramaeans" after the ancient Aramaeans, advocated by some followers of the Syriac Orthodox Church, Syriac Catholic Church and Maronite Church. "Chaldeans", after ancient Chaldea, advocated by some followers of the Chaldean Catholic Church. The terminological problem goes back to colonial times, but it became more acute in 1946, when with the independence of Syria, the adjective Syrian referred to an independent state. The controversy isn't restricted to exonyms like English "Assyrian" vs. "Aramaean", but also applies to self-designation in Neo-Aramaic, the "Aramaean" faction endorses both Sūryāyē and Ārāmayē , while the "Assyrian" faction insists on Āṯūrāyē but also accepts Sūryāyē . The question of ethnic identity and self-designation is sometimes connected to the scholarly debate on the etymology of "Syria". The question has a long history of academic controversy, but mainstream opinion currently favours that Syria is indeed ultimately derived from the Assyrian term Aššūrāyu. Meanwhile, some scholars has disclaimed the theory of Syrian being derived from Assyrian as "simply naive", and detracted its importance to the naming conflict. Rudolf Macuch points out that the Eastern Neo-Aramaic press initially used the term "Syrian" (suryêta) and only much later, with the rise of nationalism, switched to "Assyrian" (atorêta). According to Tsereteli, however, a Georgian equivalent of "Assyrians" appears in ancient Georgian and Armenian documents. This correlates with the theory of the nations to the East of Mesopotamia knew the group as Assyrians, while to the West, beginning with Greek influence, the group was known as Syrians. 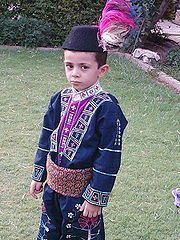 Assyrian child dressed in traditional clothes. Assyrian culture is largely influenced by religion. The language is tied to the church as well for it uses the Syriac language in liturgy. Festivals occur during religious holidays such as Easter and Christmas. There are also secular holidays such as Kha b-Nisan (vernal equinox). There are many Assyrian customs that are common in other Middle Eastern cultures. A parent will often place an eye pendant on their baby to prevent "an evil eye being cast upon it". Spitting on anyone or their belongings is seen as a grave insult. Children are often given Biblical names, and, by Assyrianist patriots, Assyrian names such as Ashur, Sargon, Shamiram, Nineveh, Ninos, Nimrod, etc. And to the contrary by the Aramaean/Syriac nationalists, Aramaean/Syriac names such as Abgar, Aram, Afrem, Aryu, etc.Baptism and First Communion are extensively celebrated events similar to how a Bris and a Bar Mitzvah are in Judaism. In the event of a death, three days after burial there is a gathering to celebrate them rising to heaven (as did Jesus), after seven days another gathering commemorates their passing. A close family member wears only black clothes for forty days and forty nights, or sometimes one year, as a sign of respect. The Neo-Aramaic languages are ultimately descended from Old Aramaic, the lingua franca in the later phase of the Neo-Assyrian Empire, displacing the East Semitic Assyrian dialect of Akkadian. Aramaic was the language of commerce, trade and communication and became the vernacular language of Assyria in classical antiquity. By the first century AD, Akkadian was extinct, although some loaned vocabulary survives in Neo-Aramaic. Most Assyrians speak an Eastern Aramaic language whose dialects include Chaldean and Turoyo as well as Assyrian.All are classified as Neo-Aramaic languages and are written using Syriac script, a derivative of the ancient Aramaic script. Assyrians also may speak one or more languages of their country of residence. To the native speaker, "Syriac" is usually called Soureth or Suret. A wide variety of dialects exist, including Assyrian Neo-Aramaic, Chaldean Neo-Aramaic, and Turoyo. Being stateless, Assyrians also learn the language or languages of their adopted country, usually Arabic, Armenian, Persian or Turkish. In northern Iraq and western Iran, Turkish and Kurdish is widely spoken. Recent archaeological evidence includes a statue from Syria with Assyrian and Aramaic inscriptions. It is the oldest known Aramaic text. Assyrians belong to various Christian denominations, some of which are the Church of the East, with an estimated 300,000 members, the Chaldean Catholic Church, with about 900,000 members, and the Syriac Orthodox Church which has 100,000 to 4,000,000 members around the world, and various Protestant churches.Mar Dinkha IV, who resides in Chicago Illinois, and Mar Addai II, whose headquarters are in Baghdad , are Patriarchs of the Assyrian Church of the East and the Ancient Church of the East respectively. Mar Emmanuel III Cardinal Delly, the Patriarch of the Chaldean Catholic Church, has become the first Patriarch to have been elevated to Cardinal when he joined the college of cardinals in November 2007. The current Patriarch of the Syriac Orthodox Church is Ignatius Zakka I Iwas. The Syriac Orthodox Church's headquarters are located in Damascus . adherents of the Assyrian Church of the East & Ancient Church of the East, also called East Syrians or Assyrians. adherents of the Chaldean Catholic Church, also called Chaldeans or Chaldo-Assyrians. adherents of the West Syrian Rite, also called Syriacs, and formerly also Jacobites. A small minority of Assyrians accepted the Protestant Reformation in the 20th century, possibly due to British influences, and is now organized in the Assyrian Evangelical Church, the Assyrian Pentecostal Church and other Protestant Assyrian groups. Zoorna (basic flute) and dahola (large two-sided drum) became the most common musical instruments for tribal music. Some well known Assyrian/Syriac singers in modern times are Habib Mousa, Josef Özer, Janan Sawa and Linda George. The first International Aramaic Music Festival was held in Lebanon from 1 August until 4 August, 2008 for Assyrian people internationally. Assyrian/Syriac festivals tend to be closely associated with their Christian faith, of which Easter is the most prominent of the celebrations. Assyrian/Syriac members of the Assyrian Church of the East, Chaldean Catholic Church and Syriac Catholic Church follow the Gregorian calendar and as a result celebrate Easter on a Sunday between March 22 and April 25 inclusively. While Assyrian/Syriac members of the Syriac Orthodox Church and Ancient Church of the East celebrate Easter on a Sunday between April 4 and May 8 inclusively on the Gregorian calendar (March 22 and April 25 on the Julian calendar). During Lent Assyrian/Syriacs are encouraged to fast for 50 days from meat and any other foods which are animal based. Distinctively Assyrian language names are attested into the Sassanid period before they are replaced by Christian names.Biblical names in English/Arabic/Syriac variants are Syriac tradition. Names like Daniel, David, Gabriel, George, Jacob, Josef, Thomas, Peter, James, John, Elias and Maria are of clear religious origin, although many of the mentioned names are in Aramaic. French and Italian names are also given; Jean, Pierre, Lawrence. Names of Turkish and Arab origin are also prominent, for instance, in Turkey (ex. Tur Abdin , Midyat ) have predominantly Turkish surnames as a result of the Turkish law that forbids Assyrians to baptize Assyrian names to their childen. The usage of names dating back to Assyrian and Akkadian Empire such as Sargon, Ashur, Ramsen, Ninos, Sanharib, Ninurta are also used by Assyrian/Syriacs. Late 20th century DNA analysis conducted by Cavalli-Sforza, Paolo Menozzi and Alberto Piazza, "shows that Assyrians have a distinct genetic profile that distinguishes their population from any other population." Genetic analysis of the Assyrians of Persia demonstrated that they were "closed" with little "intermixture" with the Muslim Persian population and that an individual Assyrian's genetic makeup is relatively close to that of the Assyrian population as a whole. Cavalli-Sforza et al. state in addition, "[T]he Assyrians are a fairly homogeneous group of people, believed to originate from the land of old Assyria in northern Iraq", and "they are Christians and are possibly bona fide descendants of their namesakes." Regarding the homogeneity of the Assyrian people, according to a recent study by Kevin MacDonald, the Assyrians tend to encourage endogamy. "The genetic data are compatible with historical data that religion played a major role in maintaining the Assyrian population's separate identity during the Christian era". an anglicization of the Aramaic name, also as Suraye/Suryaye; e.g. in Al-Ali et al., New Approaches to Migration? (Routledge 2002, p. 20) used synonymously with "Syriac Christians". * SOC News report , He was documenting life in the Tur Abdin, where about 3,000 members of the Aramean minority still live. "Eastern Churches", Catholic Encyclopedia, see "Eastern Syrians" and "Western Syrians" respectively. Modern terminology within the group is Western Assyrians and Eastern Assyrians respectively, while those who reject the Assyrian identity opt for Syriacs rather than Assyrian or Syrian. Rudolf Macuch, Geschichte der spät- und neusyrischen Literatur, New York: de Gruyter, 1976. Tsereteli, Sovremennyj assirijskij jazyk, Moscow: Nauka, 1964. Chamberlain, AF. "Notes on Some Aspects of the Folk-Psychology of Night". American Journal of Psychology, 1908 - JSTOR. Gansell, AR. FROM MESOPOTAMIA TO MODERN SYRIA: ETHNOARCHAEOLOGICAL PERSPECTIVES ON FEMALE ADORNMENT DURING RITES. Ancient Near Eastern Art in Context. 2007 - Brill Academic Publishers. Chambers, C. End-of-Life Rituals. 2006. Cherrytree Books. pp 76-81. Bae, C. Aramaic as a Lingua Franca During the Persian Empire (538-333 BCE). Journal of Universal Language. March 2004, 1-20. The Date of Easter. Article from United States Naval Observatory (March 27, 2007). Minorities in the Middle East: A History of Struggle and Self-expression" By Mordechai Nisan. Page 181.